← New SU Catalogue Launch Demo and Mini Class! Outdone by a 6 year old Crafter! So he proceeded to make the most AMAZING card – and I can honestly say that the only think I helped him do was cut out the last half of his robot because he wanted to keep the broken coil/spring at the top and thought he would probably cut it off. 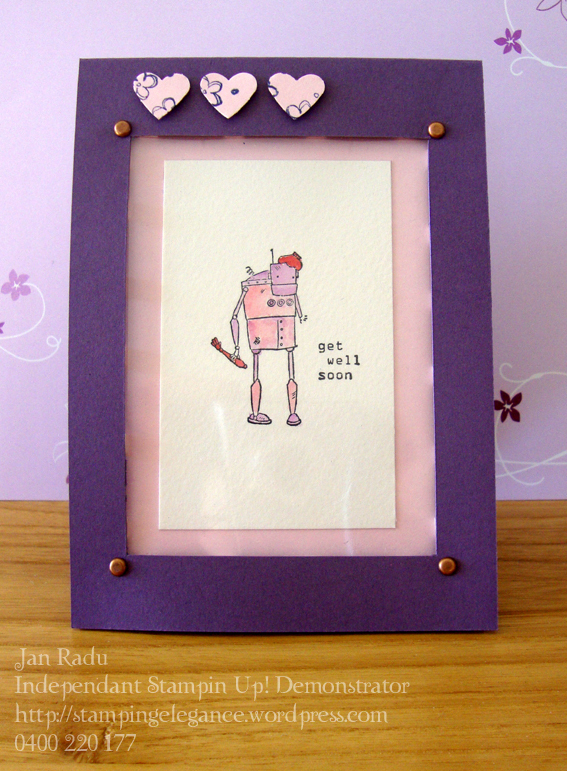 I love how he has just sticky taped the robot on – how cute is that adhesive option??? I am proud as punch I gotta tell you! And what’s more…I LOVE HIS COLOUR COMBINATION! Laurenz honey can I please case your card which means I love it soooo much that I would like to copy it? Of Course you can Mum! But I was right about Laurenz’s colour combo – My version is Perfect Plum, Pink Pirhouette, with a hint of Riding Hood Red ink as a focul point in the image – exactly like my boy did! So who’s do you like best? Be honest now!!!! Ummm… will I be in trouble if I say I love Laurenz’s?? Wanna know what sealed the deal? The sticky tape. It’s such a great visual metaphor – sticking someone back together again the best way you know how. Love it!! looks like I should turn my 7 year old loose in my stampin supplies more often! 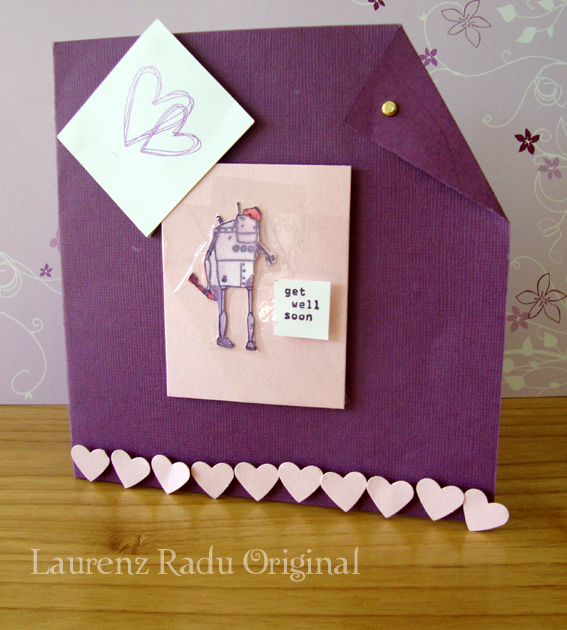 Laurenz’s card is amazing (I like your too 😉 My most favourite bit – the row of hearts at the bottom – fabulous! Fantastic effort! He must take after mum!!! Love your AMAZING owl card too by the way from JAI can’t find it here to leave a comment!! SUPER JOB!! Oh Jan, it’s a hard decision! I love both of them. Aren’t boys beautiful? I love the way they craft. Laurenz did a fabulous job.